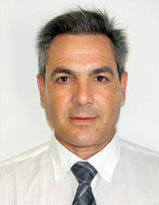 Dr. Christos N. Christodoulou-Volos is an Associate Professor of Economics and Finance and since and since September 2012 the Director of Business School (BScABF, BScBA & MBA) Programmes . He received an MA in economics from the City College of the City University of New York (CUNY), an MPhil and a Ph.D. in economics in 1997 from the Graduate School of the CUNY. His areas of specialization are Macroeconometrics and Monetary and Financial Economics. His teaching interests are in the areas of Macroeconomics, Financial Economics, Finance, Statistics, and Econometrics and he has taught in many universities worldwide. He has published many scientific articles in leading academic journals and his current research interests are in the broad field of empirical macroeconomics and financial economics, including the problem of pricing and hedging of financial assets, decisions making under uncertainty, and the application of econometric models, such as, univariate and multivariate GARCH models, FIGARCH models, and correlated unobserved components model, and the effects of economic uncertainty on real estate. For a number of years, he held managerial positions in well‐known companies in the United States, as a senior economist for a trade association and as Economist for a financial company dealing with litigation economics, in USA.